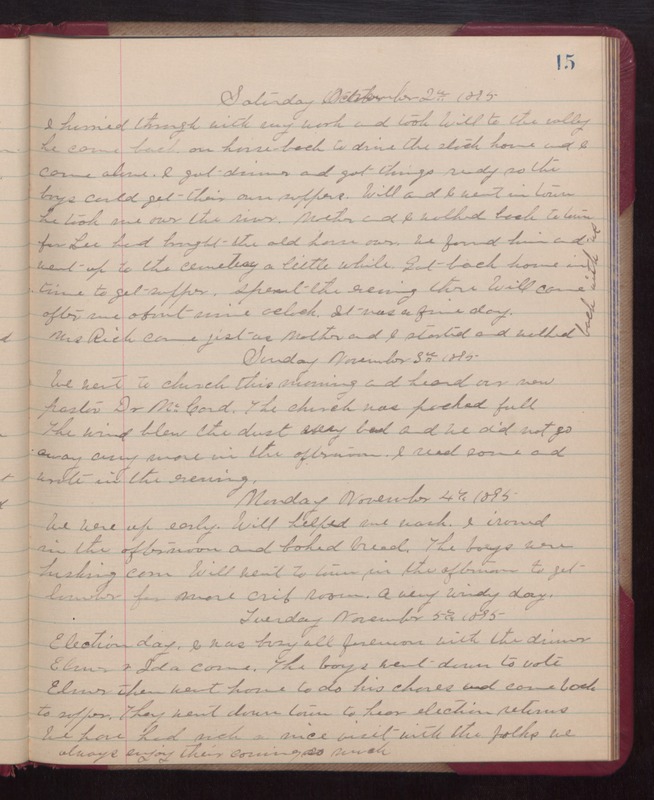 Saturday November 2nd 1895 I hurried through with my work and took Will to the valley. he came back on horseback to drive the stock home and I cae alone. I got dinner and got things ready so the boys could get their on suppers. Will and I went in town he took me over the river. Mother and I walked back to town for Lee had brought the old horse over. We found him and went up to the cemetery a little while. Got back home in time to get supper. Spent the evening there. Will came after me about nine oclock. It was fine day. Mrs. Rich came just as Mother and I started and walked back with me. Sunday November 3rd 1896 We went to church this morning and heard our new pastor Dr. McCord. The church was packed full. The wind blew the dust very bad and we did not go away any more in the afternoon. I read some and wrote in the evening. Monday November 4th 1895. We were up early. Will helped me wash. I ironed in the afternoon and baked bread. The boys were husking corn. Will went to town in the afternoon to get lumber for more crib room. A very windy day. Tuesday November 5th 1895. Election day. I was busy all forenoon with the dinner. Elmer and Ida came. The boys went down to vote Elmer then went home to do his chorse and came back to supper. They went down town to hear election returns. We have had such a nice visit with the folks we always enjoy their coming so much.